This shop has been compensated by Collective Bias, Inc. and its advertiser. All opinions are mine alone. #SweetenTheSpread #CollectiveBias I LOVE parties so much I could use any reason to throw one. Football is a great example, I’m not a diehard football fan, I’ll literally cheer for whichever team is winning. My husband on the other hand, well the guy LOVES football and LOVES his team. To me, it’s the perfect occasion to throw a beautifully decorated party (with delicious eats) to celebrate watching the game together with some of our favorite people. Because football is more of my husbands thing, I wanted this spread to have the snacks he loved, and be beautiful arranged so I could enjoy looking at it. The menu included: hotdogs with mustard, chips with onion dip, veggies, apples with a creamy caramel dip (this stuff is to die for), homemade Snickers pudding trifles (could this day get any better? ), a Skittles soda bar, and extra Snickers and Skittles candies to munch. I was able to get almost everything for this party from Target (Target= Chelsey’s Happy place) and save a few dollars with the Cartwheel App, there are deals for snacks starting today through 2/6/16 too. I actually created a few new recipes just for this party, and although there were some iffy moments, I’m really happy to share how everything turned out! Take a peek and remember I’ve got you covered with all of the recipes and tutorials you’ll need later in the post. Start by separating the Skittles by color. I had approximately 1 cup worth of each color once I separated out two 14oz bags. Place one color into a (very dry) food processor and mix. WARNING: This will be so incredibly loud that your child may start yelling at you to stop because it hurts her ears. It’s pretty loud. Repeat and grind each color, consider why you don’t have ear plugs in the house, add them to your list for your next Target run. Tip: If you don’t want to deal with the hassle of cleaning the food processor in between colors, grind them up in the order of the rainbow: green, yellow, orange, red and purple. I’d still recommend that you dump the remaining dust into the sink in between colors, but do not wet the food processor bowl unless you plan to completely dry it before starting a new color. Once you have your Skittle “dust”, place the powder (leaving behind any big pieces) and fill the cutest little jars you can find. These were found on the party isle at Target. Fill a glass with your choice of fruit flavored sparkling water and ice. Add the desired amount of Skittle dust and mix very well. Before you freak-out about the foamy looking floaties on the top, just know that I’ve got your back and have already done all of the freaking out for you. You can do what I did in this order: panic, wonder why this recipe is fighting you, mix a few other colors (its just a fluke right?) and get the same result, calm yourself down and think of solutions. Think Chelsey, think! Or you could just cover those bad boys up with some whipped cream and garnish with a little more Skittle dust and a cute paper straw. Once you stir it all together they dissolve and go away. So there were a few hiccups with this recipe, it was nothing that couldn’t be remedied with whipped cream and more Skittles. Ta-da! Put 1 1/2 cups of milk, sugar, and cocoa in a sauce pan and bring to a simmer over medium heat. After the ingredients have combined, remove from heat. In a separate bowl, whisk the remaining 1/2 cup of milk, cornstarch, egg yolks and vanilla together. Slowly combine the egg mixture with the chocolate mixture constantly whisking. Cook over medium-high heat, constantly whisking until the pudding thickens, about 2-3 minutes. Enjoy a spoonful or two (quality control) and set aside for Snickers trifle. Place the creamy caramel dip in a plastic baggie and cut the corner to use as a piping bag. Pipe a small amount into four miniature trifle dishes. Next layer peanuts and drizzle a little caramel topping on the top. Carefully spoon in homemade chocolate pudding, smooth the top. Garnish with whipped cream, chopped peanuts and chopped Snickers bar. Enjoy! This party was so much fun and our guests loved all of the food. 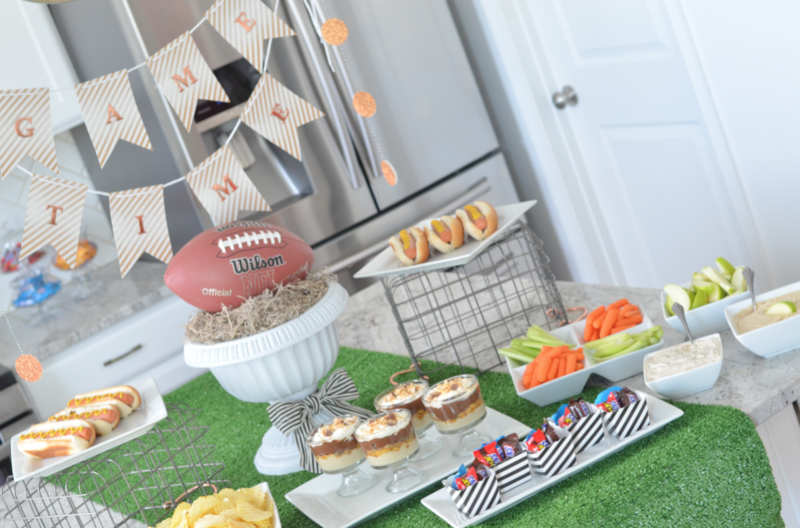 To recreate these recipes and tablescape for your next party, head over to Targetyoursweettooth.com for inspirations, then run into Target, make sure to look for an enormous football (on an end cap), you’ll find all of the ingredients you need. What recipes will you be serving for your next football watching party?